It's Gingersnaps challenge day again - today the challenge is Kraft. Easy peasy for me, one of my favourite and most used colours. I chose to make a mini album - I think Kraft is a perfect colour for seaside-themed creations. 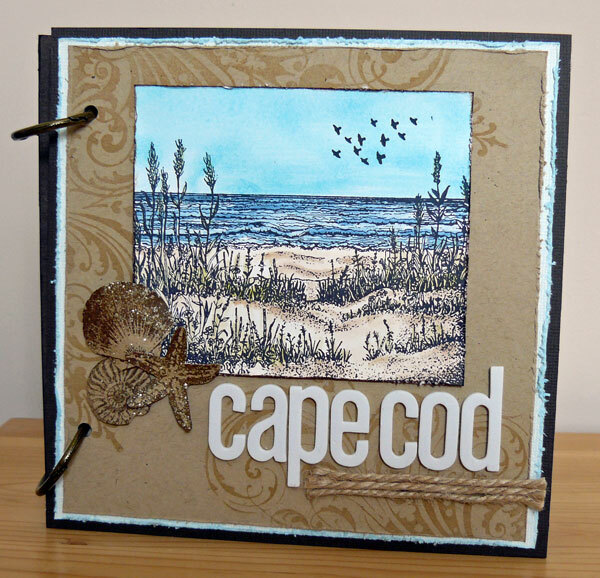 This 6x6 mini album will hold images of my holiday in Cape Cod. Confession time - I had planned to do a layout to show you here but I didn't get time....). I do wish life wouldn't get in the way of crafting - it's very inconvenient!!! 1 Cut two covers from chipboard 6 1/2", cover with brown cardstock front and back. 2 Cut a piece of Kraft card 6" square and stamp with the flourishes (Fancy Pants) in Versamark, chalk over the Versamark in a tan coloured chalk. Distress edges. Cut a mat for this in sanded Core'dinations card and distress the edges of this too. 3 Stamp the Picturesque scene and colour with inks and a water brush. Stamp the birds at the top of the scene. Distress and add to the Kraft panel. 4 Stamp shells onto Kraft card, cut out and cover with Distress Stickles. When dry add using Silicone glue to get shape and dimension. 5 Assemble, adding with twine and letters. Punch holes for book rings. Decorate the inside covers with a stamped Kraft panel as created for the front. The pages inside are 6x6" Kraft card. That's it - nice and simple :). Do go along to Gingersnaps and join the challenge! I really love this Kate, its totally magic. Love your mini album! 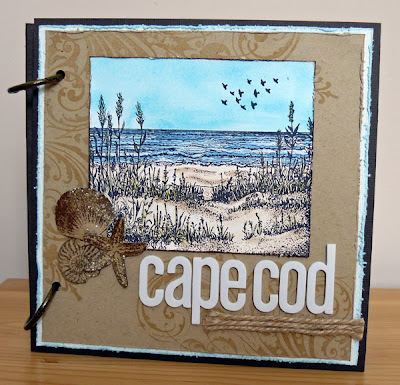 One of my fav places and the Cape and kraft/sand certainly go together! Awesome! Watch out - soppy alert!